It has been quite a while since my last Inspiration Saturday post, but it’s also been some time since I’ve had a chance to really sink my teeth into a pattern search. Many of these posts are born of a burning need to find just the right pattern for just the right yarn and lately I haven’t had any pattern-matching conundrums. However, I’ve just discovered that The Verdant Gryphon has brought back one of my favorite yarn bases (Zaftig Bugga, a worsted weight MCN blend) and well, I had to know how many skeins to buy for my next project, didn’t I? Let the luxurious, worsted-weight-accessory-pattern curating commence! The Millwater cowl by Beth Kling is one I’ve had queued for Zaftig for quite some time. Copyright Beth Kling. Click for pattern page. I knit this pattern out of Malabrigo Twist a while back and really enjoyed it. The knitting is simple and soothing, just garter stitch with a ribbed cable that is knit flat and then seamed. I think the finished piece is striking and versatile and looks lovely in semi-solids and variegated yarns. 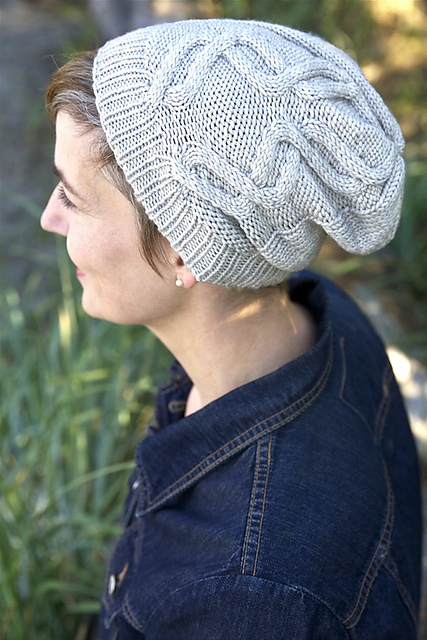 Another simple-but-striking cabled pattern is the Tidal Flats hat by Melissa Thomson. Copyright Alexa Ludeman. Click for pattern page. This hat is part of the Cascadia collection, which contains many lovely accessory and sweater patterns. This hat would work best in a semi-solid, so as not to obscure all that smooth reverse stockinette. Copyright Robin Ulrich. Click for pattern page. 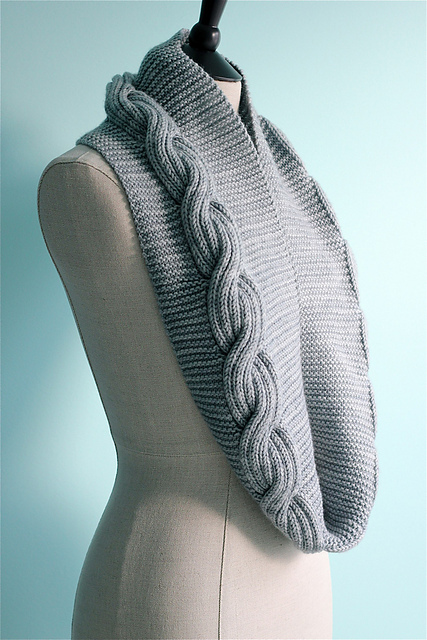 It’s just so dang elegant, and knit in worsted weight it would be cozy, beautiful, and fairly quick to knit. 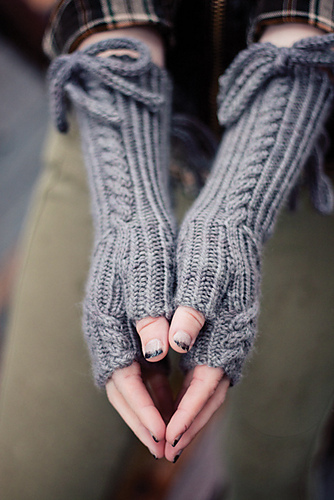 This Fission mitts by Annika Barranti would be quite cushy in Zaftig. Copyright Vivian Aubrey. Click for pattern page. Copyright Alicia Morandi. Click for pattern page. 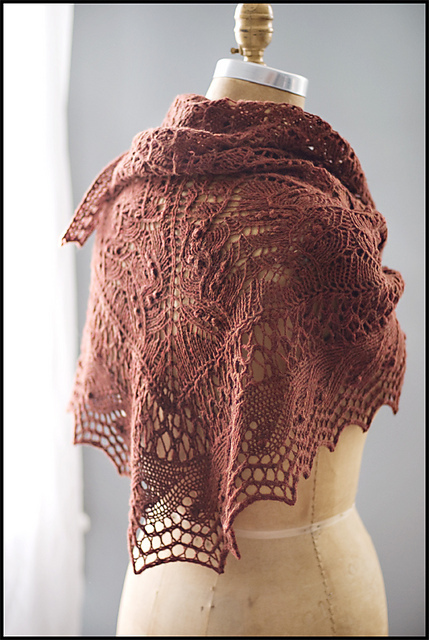 To up the elegance ante, we have the Juneberry Shawl designed by Jared Flood. Copyright Brooklyn Tweed. Click for pattern page. I’ve adored this shawl for quite some time, but have been having internal debates over whether I want to knit it out of Zaftig or something a bit drapier with some silk content, like Codex or Mondegreen. Lastly, and the pattern I will most likely knit first, is the Lucy Hat by Carina Spencer. Copyright Knitscene. Click for pattern page. I think the plump, tightly-twisted texture of Zaftig will lend great stability to this striking, structured cloche. I love the stitch definition in the photo, the possibility of amazing color combination, and that jaunty flipped brim. This hat needs to be rocked so hard, and I plan to rock it well. Have you been inspired by anything in particular lately? What’s your favorite use for worsted weight yarn? Let us know in the comments below! This entry was posted in Bugga, cowls, hats, InspirationSaturday, knitting, mitts, scarves, shawls, VerdantGryphon and tagged inspiration, knitting, patterns, yarn by shoelaceswitcher. Bookmark the permalink. You’ve found some lovely patterns there! Inspiration lately has come from color and short rows – the sweater I want to start uses both. I like your selections here also. Specifically the mitts and that first cowl. WOW what a beauty. Yeah, that first cowl is a real stunner! Mine is detailed here, http://chrisknits.wordpress.com/2014/10/25/inspiration-saturday-6/, but mostly hats are taking me by storm. There always seems to be a month out of the year when I go hat crazy! oooh, a gorgeous worsted roundup! 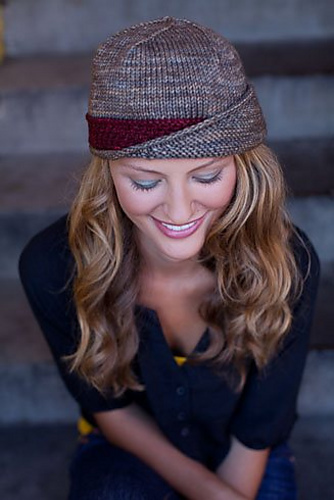 the Lucy hat is stunning, but I adore that Millwater cowl, it looks so timeless and cozy! Well I’m inspired by all that you have shared here, so many pretty patterns! The cowl is by far my favorite though, definitely queued!